In a large skillet, heat the olive oil over high heat and toast the tortellini for 1 minute. Pour in the warm water, cover and let the tortellini steam-cook for 4 to 5 minutes. Once they have swelled, stir in the heavy cream, mascarpone cheese and grated Parmesan cheese. Stir and let simmer over low heat for 4 to 5 more minutes. Season with pepper to taste. Lay the asparagus in a single layer on a baking sheet and drizzle olive oil and seasoning salt over the top. Roast in the preheated oven for 6 to 8 minutes, or until bright green and fork tender. 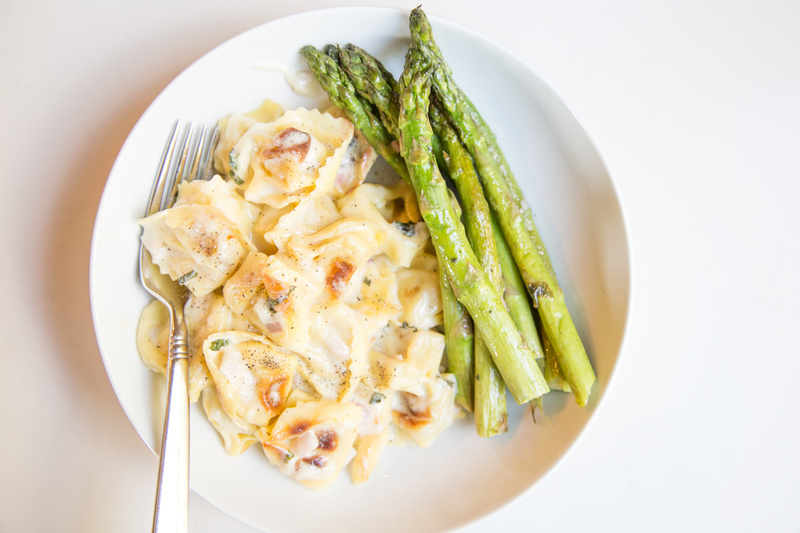 Serve Pan Roasted Tortellini and Asparagus with fresh basil garnish.